Hi Fan’s welcome to my page and nice to meet you.This post contains some compilation of my old songs.Kindly click on this links below to listen to all my songs in one page. You can also copy and pasted this links below on your browser to search OR Google Search Mr Emma Uzo for more informations. Don’t forget to subscribe to my YouTube channel.Remember to like and comment. Sharing is caring. I’m currently working on my next song which will be out before the end of this month,stay tuned. this song titled Ofor Ndu is translated as Justice of life.it is a nice track which advices people to help their fellow friends in need of help. It’s was released on last December and this is the link. It will be ok is an inspirational song which advices to believe that Everything will be ok no matter what they are going through. This is a very nice track for everything music lovers. It was released between last August and September and this is the link. You can Google Mr Emma Uzo for more. For booking,featuring and more enquiry about Mr Emma visit this website page. Thanks you so much for your support and have a wonderful day. Hi Fan’s welcome to my page and nice to meet you.This post contains some compilation of my old songs.Kindly click on this links below to listen to all my songs in one page. You can also copy and pasted this links below on your browser to search OR Google Search Mr Emma Uzo for more informations. Don’t forget to subscribe to my YouTube channel.Remember to like and comment. Sharing is caring. I’m currently working on my next song which will be out before the end of this month,stay tuned. Mr Emma-Ofor Ndu this song titled Ofor Ndu is translated as Justice of life.it is a nice track which advices people to help their fellow friends in need of help. It’s was released on last December and this is the link. #https://youtu.be/ax41YvPr4Lw Mr Emma-It will be ok It will be ok is an inspirational song which advices to believe that Everything will be ok no matter what they are going through. This is a very nice track for everything music lovers. It was released between last August and September and this is the link. #https://youtu.be/uQ3z5RXusCI Mr Emma-My dreams My dream is a motivational and inspiring song specially dedicated to everyone that loves good music.This is a good track which gives a lot of teaching lessons to the young youth.It is a must have song for everybody that supports good music. 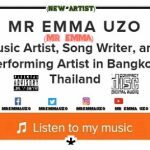 It’s was released on between last March and April.This is the link below #https://youtu.be/aHm1V97rOyE Mr Emma Uzo Mr Emma-is a talented foreign based music artist.I am into all types of hip-hop music and I’m all about entertainment. Follow me on all social media to know more about me,Link on my bio for more details and stay tuned for more information. Kindly click on this link below to like my facebook page #http://facebook.com/mremmauzo You can Google Mr Emma Uzo for more. For booking,featuring and more enquiry about Mr Emma visit this website page. Thanks you so much for your support and have a wonderful day.